Well I was really tickled pink that things have been going ok with my project till my dad noticed what I would have found out not to long from now.1 of my hubs is wore slap out.I didnt notice it when I bought it at Chickasha.Dont know what I paid for it but anyhow.Naturaly it is the 1 with the good lug studs. But when looking these over I found the inards to be different. This is the 1 I say is wore out.I aint sure a shim is a solution or not.That is 1 of my questions. I aint tried either on a axle tightened up yet. This 1 has 3 bad studs but it is ok other wise.The centers of both of these are different.IS either 1 wrong or will both styles work? If I am going to have to go on the hunt for a rear hub,I probably need to know that before hand. Thanks for any advice or ideas.I reckon I will check ebay after while.It may be a week or 2 before the budget will allow this size purchase.It seems these things aint cheap best I can rememeber. I don't see the ware, the keyway looks good to me. Please explain your concerns. Bob,the first photo is of the questionable hub.It slides all the way up,and is still purty loose.I am bidding on 1 on ebay.I will have to remove this brake drum.Since I am going to have to get a tool and lug studs for the other 1,I can do the replacement to.I just hope the taper is good on the 1 I am bidding on. My machinist can put new tapered center in your worn one. As I recal ,runs about $25-30 apiece. OK,Jack,If I dont win the 1 on ebay,I will git up with you and see about putting this thing in a priorty mail box with money and send it to you to see about getting him to do it. That is a viable alternative to buying new for sure. Mack,get a good axle and check the fit on it. Ok I won the hub on ebay.It is made like the second picture.So now to fiqure out how to remove the wheel studs without messing up my brake drum. I wont chunk this old hub,I like the idea of installing a new center.I wish I had held off bidding and waited for other options like this 1,that woulda been a better option...But I was staring at the hub,knowing my project could be held up finding 1. The top 1 slides up on the axles to far in my opionion.the taper is worn out.a shim mighta fixed it. Is there a problem with putting a shim on these axles for the used hubs to take up wear just for a precaution? Just make sure there are no raised edges on the keyway, or anywhere else, that would prevent things from settling in properly so you don't wind up with a wobbly wheel. 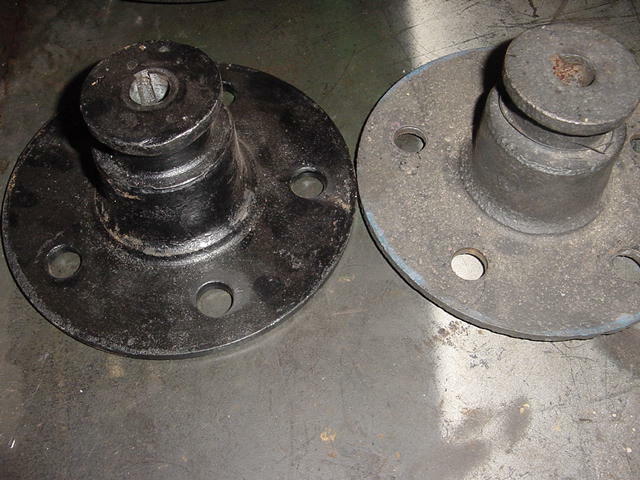 Axle shims do not repair worn out hubs or shafts. When a hub contacts an axle on only a few high spots, due to wear in one or both, those high spots will quickly wear through a shim allwoing the hub to once again be loose. 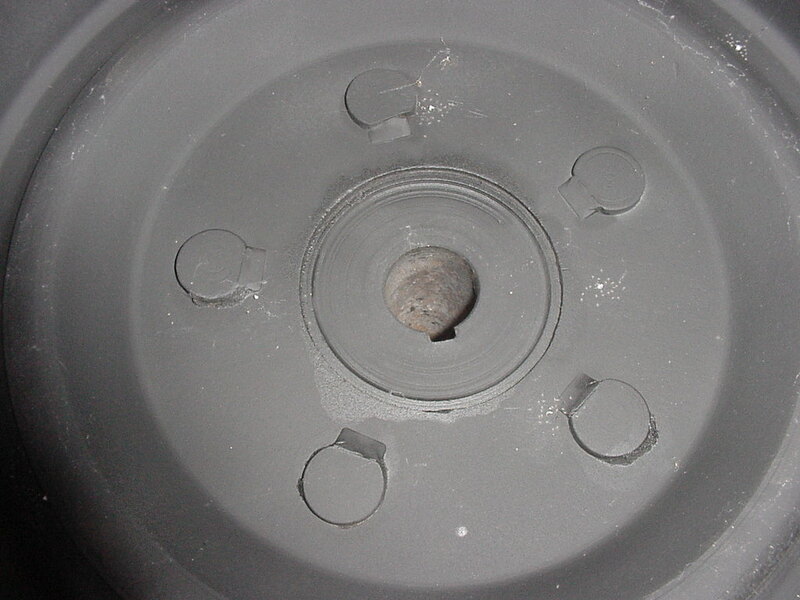 The resulting loose fit will continue to chew away at the shim until its supposed benefit is gone, the wheel is loose and the shim fragments migrate up and into the axle seal. Just because shims can be bought does not mean they're a good idea. Obviously, this is my take on it. Others will state how great shims have been for them. I'm telling what I've personally seen shims do. Won't comment on water pumps, as not a Ford part after the first 2500. But for shims, have used shims in many places for slightly worn Ford parts, we just can't get NOS most times. Shim at the axle shaft is ok in Fords I have run and run. 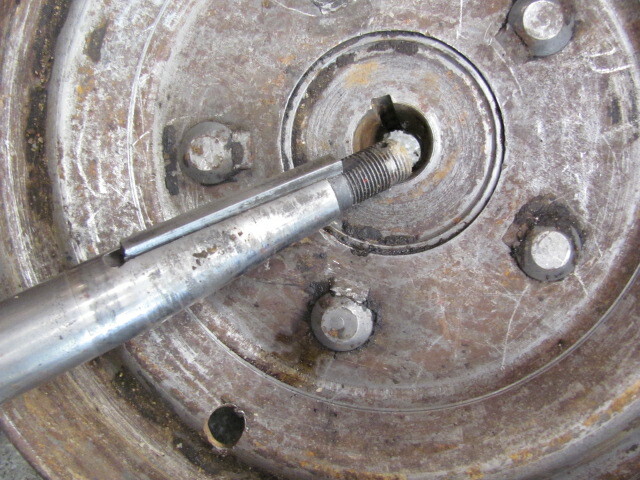 If the taper bore of the hub is ok, and the axle is ok with minor wear, a shim will snug it up just fine. Use your 24" cheater bar to wrench on the axle nut. 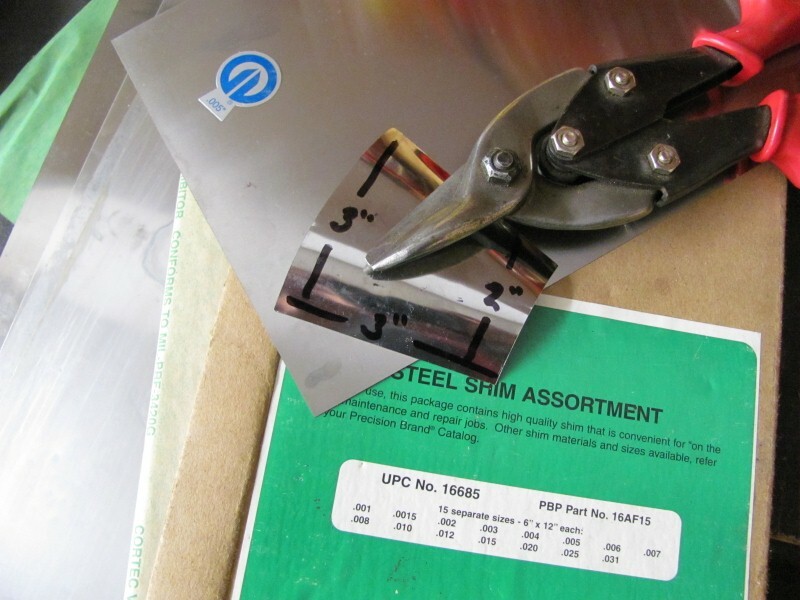 The taper fit will stay with a shim or without a shim. If the bore of the hub or shaft or key or key way is worn down, and is so worn it wobbles when test fitted, that is another story of too worn parts and shimming isn't a repair in those cases. Upon re-fitting the hub after removal, a new shim is used, re-using a shim is a shame. Yah, I know. I don't like it either. I tell you what, your comment, "If the taper bore of the hub is ok, and the axle is ok with minor wear, a shim will snug it up just fine." is one that I'll agree with. My anti-shim campaign is more aimed at those who have hopelessly worn out parts that they can't seem to part with. Shims are not a fix-all and I'll stand by my statement, "Axle shims do not repair worn out hubs or shafts." By your comments, it sounds like you might agree with that too? There is nothing wrong with shimming a rear hub. 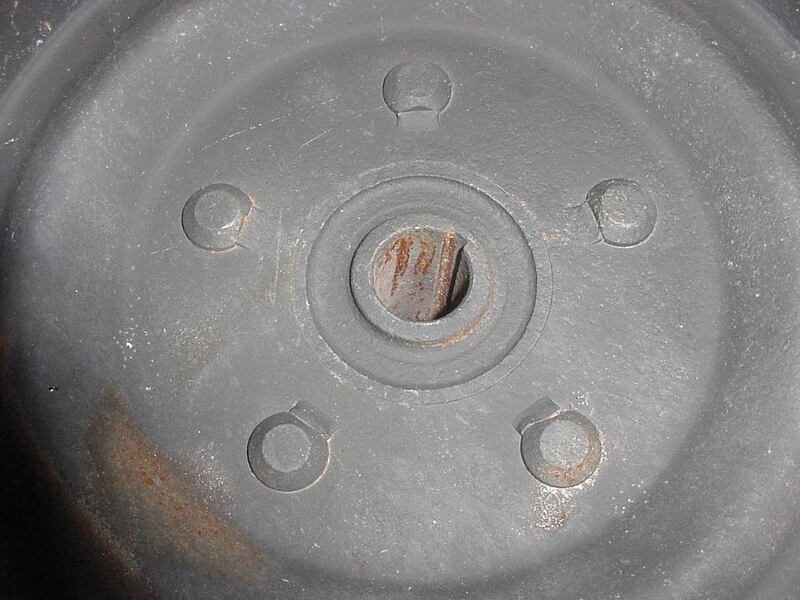 A hub that is too worn to use will generally have the keyway wallowed out. If the keyways in Mack's hubs are good then the hubs are most likely usable. If Jack's machinist can change a worn out hub to a good one for $30, I would say that's a bargain. Hopefully I will get my hub in the next few days and will be able to get started tending to this issue. I just hope I can git the studs out of my brake drum without ruining it. I have a idea that I will need to use the press and a piece of pipe that will slide over the head of the stud and I will push it out letting the pipe support the brake drum. You've got the right idea. Just be careful that the pipe doesn't lay against the raised flat. (But you knew that.) Sometimes people tack weld these studs in place. Yours look nice and not modified in that way. Hub got here today.looks good. Well,finally got back to this,The brake drum will not slide down snug to the replacement hub. The replacement has a more rounded edge in the center that the drum slides down on.I will try to post a picture.Do I make the center hole of the drum large enough,or machine down the hub?I think the drum would be the safer of the 2 to work down to fit.The shiny black 1 is the replacement part i want to use.Also,is there any reason I cant reuse these lug studs? They look fine to me.no pic of them unless needed. Got any pics of your project truck Mack? This is for the speedster project. A slow ongoing thing.I aint worked on the pickup other than drive it.Jack Daron has sent me links to good deals on roadster bodys but I aint had the bugdet to go git 1 for it.I will see if I can find the thread here with the frame work on it. I bumped the speedster progress thread up.